The core of the instrument is a Spatial Heterodyne Spectrometer (SHS), which is a relatively new type of spectrometer. Originally proposed by Pierre Connes in 1958 in a configuration which he called “Spectromètre interférential à selection par l’amplitude de modulation (SISAM)” [Connes 1958], this was impractical to use until the development of imaging detectors, after which for space applications it was re-invented by Harlander and Roesler at the University of Wisconsin [Harlander et al. 1992] and called SHS. Following this concept, a space instrument was implemented by Christoph Englert in collaboration with Harlander by the Naval Research Laboratory in the USA [Harlander et al. 2003] for the measurement of hydroxyl abundance, demonstrating the principal usage of these instrument types for space applications. The SHS has the advantage that it can be built as a monolith, which makes it quite rigid and fault tolerant, important for aerospace applications. Additionally, it can be field-widened, which increases the throughput (light-sensitivity) by approximately one to two orders of magnitude compared to a standard Michelson interferometer and by five orders of magnitude compared to a grating spectrometer. Thus, it is possible to build a small instrument which fits onto a CubeSat, while still being able to provide data with high precision for scientific applications. Similar to a Michelson interferometer, the SHS is a Fourier-transform spectrometer, but with gratings instead of mirrors in the two arms. Fig. 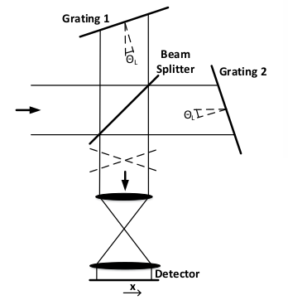 1 shows a schematic of a SHS with two gratings, beamsplitter, detector optics and detector. 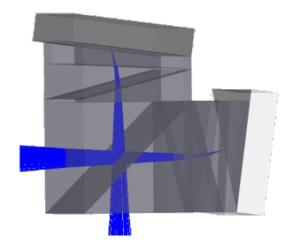 The current design of the field-widened SHS is shown in Fig. 2. Cones, P. (1958): Spectromètre interférentiel à sélection par l’amplitude de modulation, J. phys. Radium, 19-3, 215–222. Harlander, R. J., Reynolds, F. L., Roesler (1992): Spatial heterodyne spectroscopy for the exploration of diffuse interstellar emission lines at far-ultraviolet wavelengths, Astrophys. J. 396, 730–740. Harlander J.M., Roesler F.L., Englert C.R., Cardon J.G., Conway R.R., Brown C.M., Wimperis J. (2003): Robust monolithic ultraviolet interferometer for the SHIMMER instrument on STPSat-1, Appl Opt. (15), 2829-34.